The session fee includes both the pre-session consultation and the session premiere. In order to reserve your session date, your session fee of $350 is due up front as a non-refundable deposit. The session fee does not include digital images or products. Product Collections for your senior portraits start at $650. 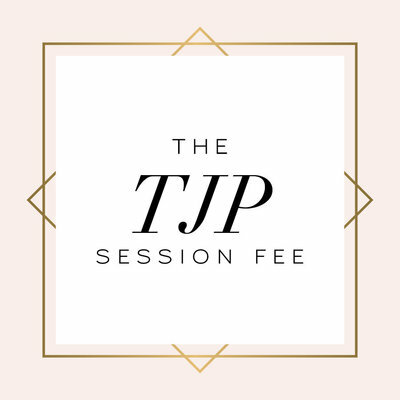 The TJP Session Fee includes all three parts of the Senior Portrait Experience. Your pre-session consult, photoshoot and session premiere are all covered. You’ll have access to a stylist, complete with exclusive clothing discounts at an amazing local boutique. On the day of your senior session, you’ll begin with professional hair + makeup, which will make you look and feel beautiful. Another bonus? The makeup artist comes on location with us for your photoshoot! She will make sure you look perfect, and you can switch up your hair + makeup for different looks. Can’t narrow down which outfits you’d like to wear for your session? No problem, you can bring up to 4 outfits!